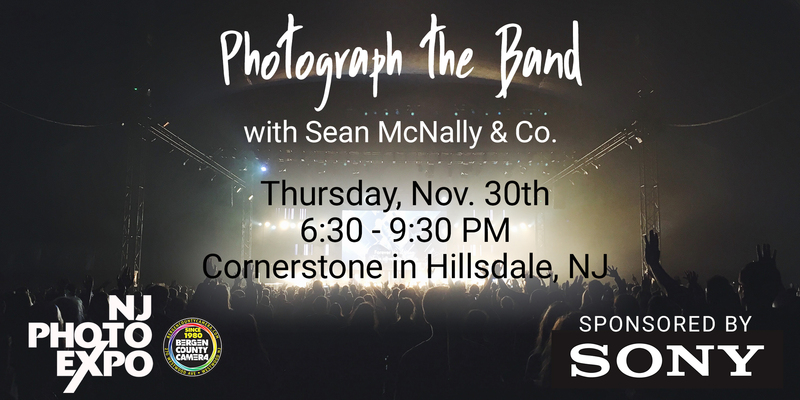 Join Bergen County Camera and Sony at the Cornerstone in Hillsdale, NJ for a private concert photography event. Learn how to shoot photos of a live band while you enjoy the music. Arrive at 6:30pm to pick up your backstage pass so you can enter our private room. Sony will have the latest cameras and lenses for you to try out during the night. Sean McNally and Company will perform a 2 hour set with plenty of time to get the perfect shot! Enjoy some light refreshments and a fun evening filled with music and photography! 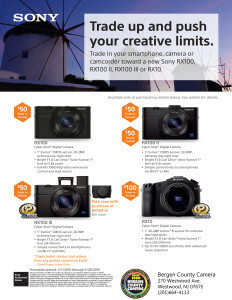 Each attendee will receive a gift card for $100 off the purchase of a Sony DSLR or lens purchase of $500 or more. 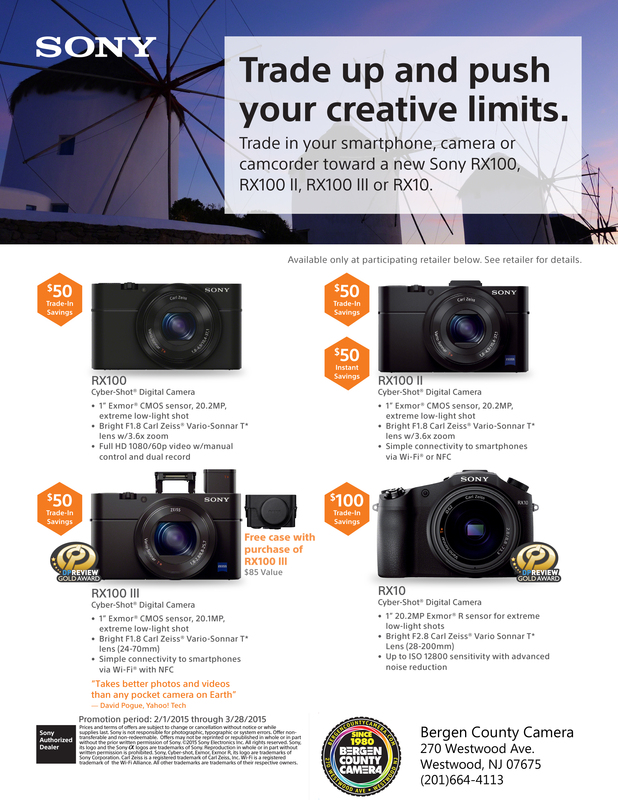 One lucky attendee will win a Sony A7R II – a $2900 value! 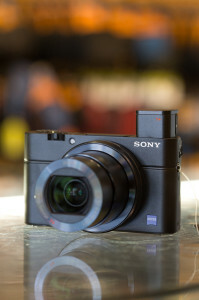 The Sony RX100 Mark III is now in stock. Featuring an impressive combination of a pop up viewfinder, a 24-70 f/1.8-2.8 Zeiss lens, and a 21 Megapixel 1 inch BSI-CMOS sensor. Stop in this week to try out Sony’s newest camera. Join us for a multi vendor demo day on Saturday May 12 and get all your Mother’s Day shopping questions answered. 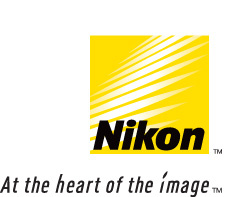 We’ll have vendor reps on hand from Canon, Nikon, Sony and Olympus to answer all of your questions. In our last installment we spoke somewhat briefly about the MiniDV format of camcorders. This time around we’re going to go into the DVD format. DVD was first introduced in the computer industry in 1995, the same year MiniDV made it’s introduction into the video market, but it was not available for video or consumer use until early 1998. DVD camcorders did not gain popularity until the year 2000. At first the image quality on DVD camcorders was lacking at best. The quality has gotten much better over time but is still not on par with either the current tape formats or the solid state/hard drive formats. This might not sound like the most compelling argument for DVD. I mean, who wants to spend money on a format in which the quality is less than it’s competing formats? Read on and you will discover. The biggest advantage to DVD format is that it’s the simplest of the video formats. It has two basic fuctions – to record and to play back. If you don’t want to fuss around with connecting the camcorder to your television DVD is the way to go. Pop the DVD into your DVD player and you’re ready to go. There can be compatability issues with playing DVD’s, though that is of minimal concern. Almost any modern DVD player (from the last 2 to 5 years) will be able to play recordable DVD’s. Other than quality the other main disadvantage is that standard DVD’s for these camcorders can only hold up to 30 minutes per disc. The discs aren’t expensive (around $15 for a 10 pack) but it can be a nuisance when recording an event that’s longer than the disc’s capacity. There is something that needs to be mentioned when it comes to different types of recordable DVD discs. There are three types of discs on the market. DVD-R (know as either “minus R” or “dash R”) will work in any DVD camcorder and is readable in almost any DVD player. DVD+R is a format that was introduced by Sony to compete with the already popularly available -R discs. +R discs hold slightly less information than -Rs but the trade-off being that the +R discs are more stable when writing information at higher speeds. You need to make sure your camcorder/DVD player are able to write/read +R discs. Both -R and +R discs also come in -/+RW formats. RW stands for re-writeable. They give you the ability to delete and re-record scenes on the DVD itself. I don’t recommend RW discs for camcorders due to the fact that they’re less reliable than standard R discs. The last and least popular of the formats is DVD-RAM. RAM discs (which stands for Random Access Memory) are also re-writeable but are more stable than their RW counterparts. RAM discs are great but just like the +R discs you need to make sure your equipment is compatible with that format. Overall I can fully recommend DVD camcorders for those looking for simplicity above all else. The image quality issue (if you would even call it that) isn’t of huge concern. To the untrained eye the image quality differences are negligible. Check back here next Wednesday for the third installment of our Intro to Video Formats column – HDD/Flash Memory. Amongst the video formats available today MiniDV has been around the longest. Initially introduced as a pro video format back in 1995, MiniDV would eventually grow into the most popular video format for both consumers and semi-professionals. Though MiniDV is becoming eclipsed in popularity by the solid state and hard drive camcorders, it is still a viable format for video recording. The first and main advantage with MiniDV tapes is the fact that it is still the most uncompressed consumer video format on the market. A single 60-minute, standard definition, $9.99 MiniDV cassette can hold up to nearly 20 gigabytes of video information. A comparable flash memory camcorder can hold 80 minutes of video on a $90 4gb SD card. If you do large amounts of video recording MiniDV can also be surprisingly affordable. The other main advantage is the ability to easily edit video from tape. Almost any computer with a firewire input has the ability to import and edit video from tape. With DVD format camcorders editing is a possibility but not recommended. It takes a lot of time and energy to edit from DVD. Flash memory or hard drive camcorders are easier to import and edit than DVD, but you do need to double check the camcorders compatability with your computer and it’s software. Now onto the disadvantages of MiniDV tape. The most evident drawback is the fact that tape is slowly going the way of the dinosaur. Blank tapes will still be available for quite some time, though it may get difficult to find the camcorders themselves. Every generation camcorder manufacterers tend to discontinue a tape model and replace it with either a flash memory or hard drive model. I’ll give MiniDV another 3 years before they’re no longer available – and I believe I’m being pretty generous. The other considerable drawback is the construction or build of the camcorders themselves. A well made camcorder will always be a well made camcorder but there’s something that all MiniDV camcorders have in common – the actual tape mechanism that inserts and ejects the tape is quite fragile. I’ve seen numerous faulty tape mechanisms over the years and it can be a real pain. Remember to treat the camcorder with care and I don’t think you’ll have a problem. I can still fully recommend MiniDV has a viable medium for video. Since it has been around for quite some time there’s not a whole lot of innovation that can be done. It’s an almost-perfected format that can’t get a whole lot better – or a whole lot worse, for that matter. If you’re shopping for video on a budget MiniDV is a great way to go. Check back next week for the following installment of our Intro to Video Formats segment – DVD.